1999 Chevy 3/4 ton 4 wheel drive Suburban. 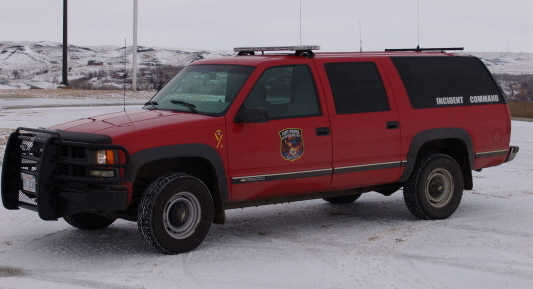 Purchased in 2006, this unit is utilized for fire command purposes as well as for traveling out of town to training and other fire department business. 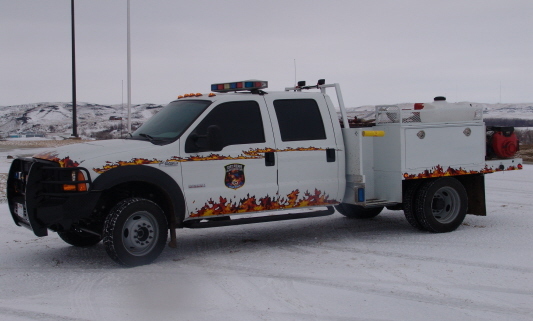 2010 E-ONE Typhoon Custom Cab pumper. Seating for 6 personnel; 450 hp Cummins engine; 1,500 gpm Hale pump; 1,000 gallon water tank; 30 gallon foam tank for Class A foam; 5,500 watt generator with 5 cab mounted scene lights; 1,000 ft. of 6" large diameter supply hose, plus over 500 ft of 2 1/2" hose & over 500 ft of 1 3/4" attack hose. Rollup compartment doors & drop down ladder rack. Carries 8 complete SCBA & 12 spare air cylinders; chainsaw; 20 ft. of hard suction hose; Akron Mercury monitor & Akron Apollo deck gun with stacked tips. Carries much more equipment, such as AED, 1st Aid, nozzles & various other fittings, etc. 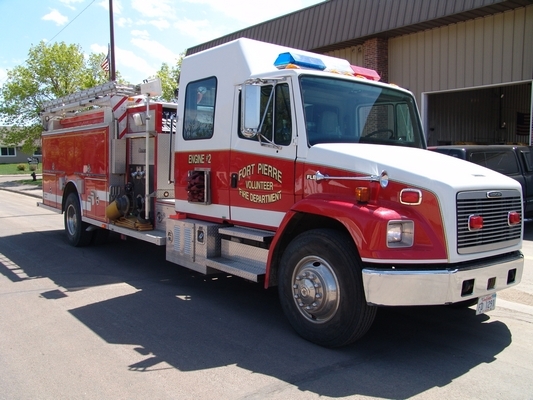 1998 Central States Fire Apparatus with 5 person cab with automatic transmission. Has a 1,500 gallon Darley pump and 1,000 gallon poly tank. Class A and B foam with 10 gallon storage tank each. 6,000 watt truck mounted generator with 2- 1,500 watt truck mounted scene lights. Carries 1000+ ft. 6" large diameter hose; 2- 1 3/4" preconnect crosslays; 1000 ft of 2 1/2" hose; K-12 saw; PPV fan; 40 ft of 6" hard suction; 8 SCBA and 10 spare bottles; various other equipment. Engine 2 is currently our RIT (Rapid Intervention Team) truck and automatically responds to Pierre for structure fires. 2007 Ford F-550 4 door four wheel drive chassis with automatic transmisison. Has a 350 gallon poly tank; Scotty foam system with 15 gallon foam cell; 100 gpm pump and electric hose reel with 100 ft of 1" wildland hose. Also carries a wildland pack which holds 500+ feet of 1" wildland hose. This is the third apparatus to have the "on fire" appearance. We have grown accustomed to the white trucks with the "flame" look. The new F2 will be updated shortly! 2000 Freightliner 300 hp extended cab chassis with automatic transmission. This tanker holds 1,300 gallons of water and the pump is 100 gpm. This unit has a quick dump; 3 SCBA; 6 spare air bottles; various other equipment and necessities. Metal work built locally and the truck put together by fire department members. First apparatus of the fleet to have the "flame" appearance. 2012 Ford F550 4x4 crew cab brush truck. 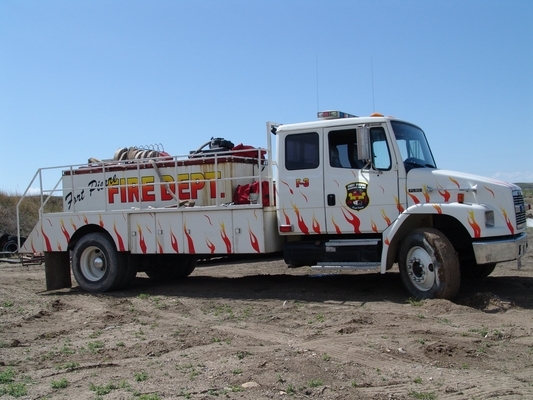 400 gallon water tank; 8 gallon foam tank; grass rig pump; booster hose reel; 410 gpm floatation pump; drafting capabilities; 12 volt scene lighting; chain saw and other wildland firefighting tools. The new Brush 1 will be updated shortly! 1949 Mack 500 gpm pumper. Was used actively until around 1980 when we received our Engine #1. Currently is only utilized for parades and other similar functions, however has driven to fire schools all across the state in recent years. Ladder 1 is a 2002 Pierce Dash 75-foot quint. Ladder 1 was purchased in early 2018 from the Village, Texas Fire Department. Ladder 1 is equipped with a 2000gpm pump supplied by a 400 gallon water tank. Like our engines, it carries over 1000 feet of hose including crosslays and large diameter supply hose. This truck carries over 100 feet in ground ladders.